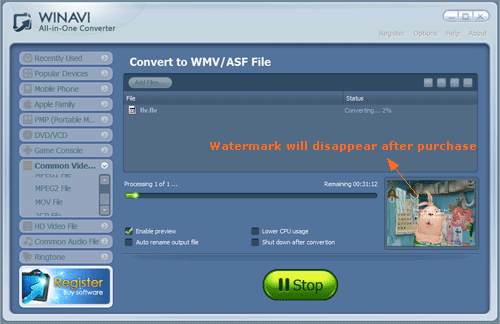 WinAVI All In One Converter is also a FLV to WMV converter. If you downloaded FLV video such as a game video from Internet some days ago, but you found the picture was so rough due to the FLV format that you are tired of watching ever if you really love it. 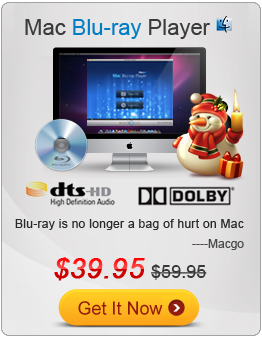 In this case, a FLV to WMV converter is really a good choice for you. After converting FLV to WMV, you can enjoy the better picture on your computer. 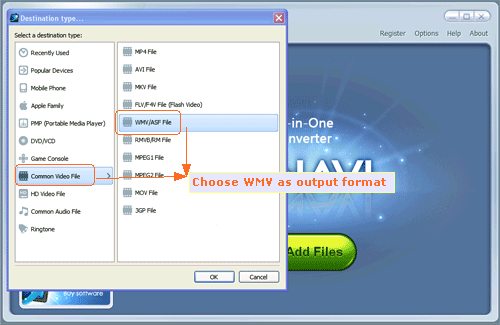 Here we will show the you detailed steps for FLV to WMV conversion with WinAVI All In One Converter. Please follow. Step 2: Load Flash FLV Video File by clicking "Add Files" and then select your wanted file to load into the program. When selected file input, a new pop-up window will ask you to set the output format. Here we choose "WMV/ASF File". In another way, you can also drag the selected file directly into WinAVI program. 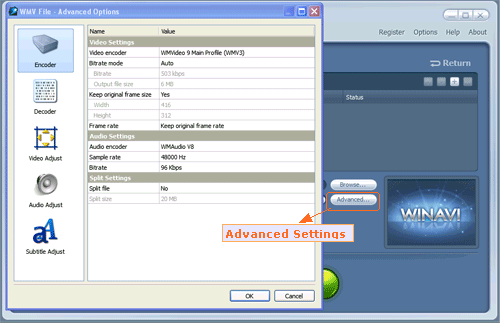 Step 3: Click "Advanced" to customize output WMV video file. You can adjust video including brightness, contrast and audio or subtitle settings. Step 4: When all the work has been done, please click "Start" and the program will switch to FLV to WMV converting interface. After it is finished, you can click "Open output directory" to find your output WMV video. Note: Trial version is limited with watermark on output. If you want to remove this watermark on screen when doing FLV to WMVconversion, please purchase and apply for a register user.